Q. Can you do a search within a particular eJournal in EBSCO? I want to search in the Journal of Youth Ministry, and other journals, and I was wondering if that is possible. 1. Go to the Library homepage. 5. On the "Publications" page, type in Journal of Youth Ministry, in the field, and click "Browse"
7. Above "Publication Details", click on "Search within this publication"
8. 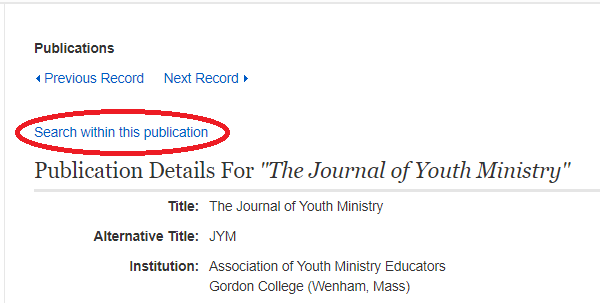 You will be directed to a searching screen with the keyword: JN "Journal of Youth Ministry" filled in--in the next two fields, type in your keywords in order to search within the title.